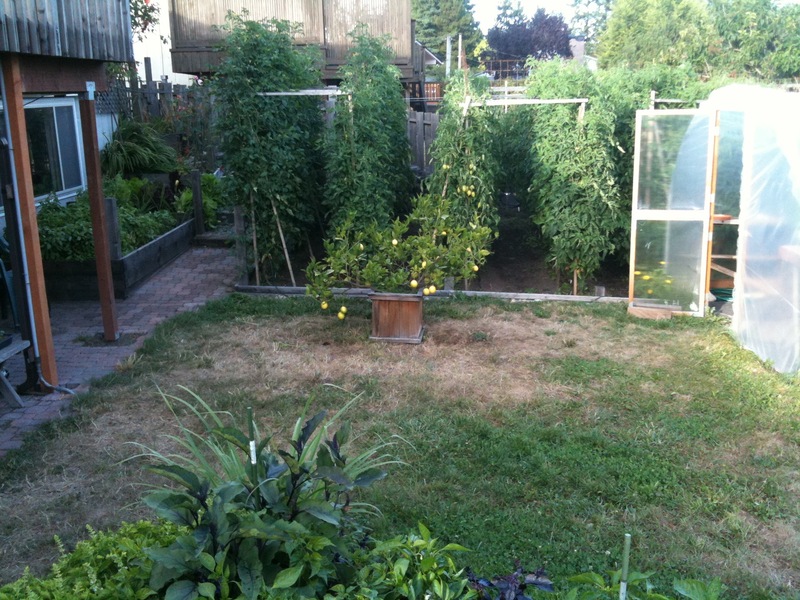 Organic veggie heaven is the only way to describe the urban garden of Diane Downie and Paul Shelley. With the resurgence of home vegetable gardening, the renewed interest in farmer’s markets and the current “Eat food, mostly plants” mantra popularized by food activist Michael Pollan, Diane and Paul have become the go-to couple for organic vegetable gardening advice. 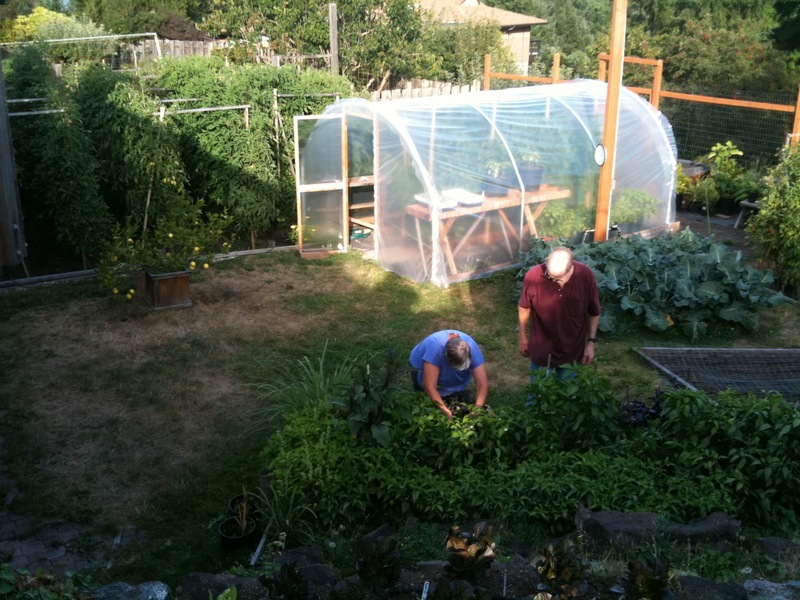 Thirty plus years of growing, harvesting, preserving and sharing organic vegetables for friends and local food banks leaves no doubt…Diane and Paul are experts. Their 1/3 acre property, surrounded with an 8 foot deer fence is located on a windy high spot in Lakewood and is filled with more than fifty (that’s right, fifty!) redwood (they last longer) raised beds overflowing with broccoli, carrots, tomatoes, eggplant, squash, sweet and hot peppers, potatoes, lettuce, basil, cucumbers and peas. 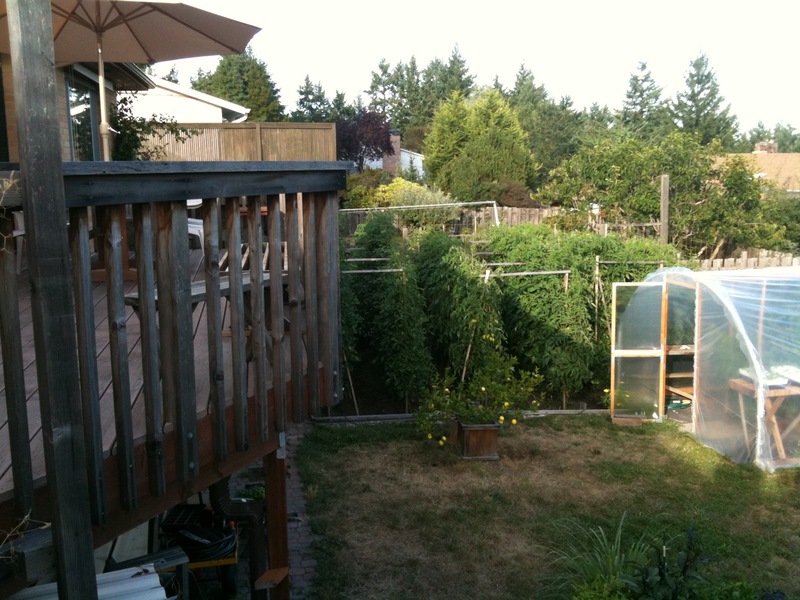 They also grow corn and green beans but they grow those in Puyallup on a shared plot. They even grow Saffron (three tiny orange stamens per crocus-like flower) and Meyer lemons (they harvest about 50 of these). Diane is a retired math teacher from Pierce College and Paul is a Boeing engineer so you can bet they’re organized. Their basement is lined with seed starting paraphernalia, drying racks and plenty of bins filled with carefully labeled produce, ready to be preserved or shared. How do they do it? What advice do they offer? Diane’s rule: “ Start with proven varieties of things you like to eat”. Paul’s rule: “Don’t step on the soil” because..
During the height of the growing season they spend at least 25 hours a week in their vegetable garden.All of the vegetables are grown from seed. It’s not only more economical but seeds are a way to try varieties you might not be able to find as plants in a nursery. Case in point, each year they grow about 60 different varieties of tomatoes, some are reliable old favorites like Sungold, Goliath and the grape size one called Sugary but a majority are heirloom varieties they grow out of curiosity. Their secret for getting them to ripen? Tomato plants are planted a foot apart and grown straight up on 8 foot fencing which exposes more of the vines to our “iffy” sunny days. The harvested tomatoes are roasted and frozen or dehydrated. Vertical gardening is the common theme throughout their garden and the main reason it is unlike other vegetable garden. There is no wasted space. “Sugar Snap” pea vines reach to the roofline and sweet Tristar strawberries grow at their base. Squash and cucumbers form harvestable walls. Sidewalks are lined with 6 different varieties of basil, including their favorite, Spicy Saber. 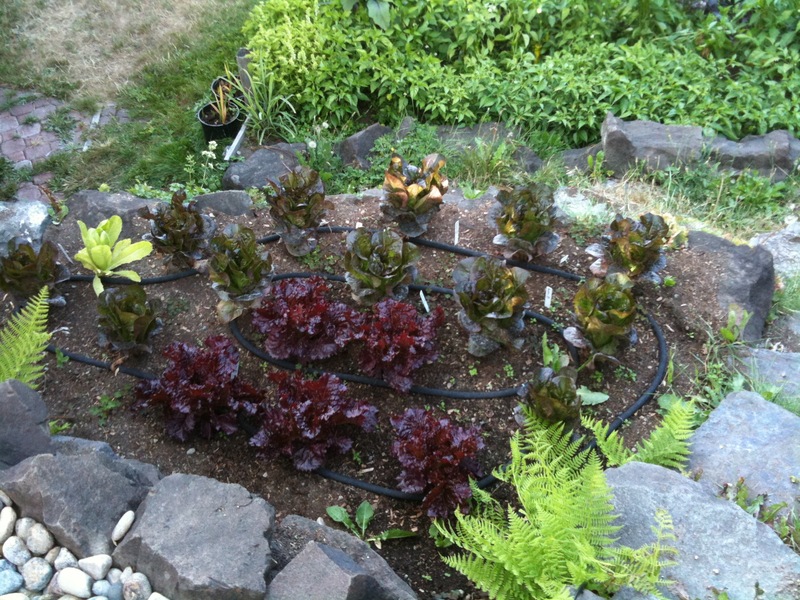 Lettuces line up in front of eggplant and both hot and sweet pepper plants. A crop of their favorite Pakman broccoli comes out and in goes a heavily seeded crop of rainbow colored carrots. They use floating row covers (sold at most nurseries) on the carrots. Row covers protect carrots from carrot rust fly, a particularly annoying insect whose larvae create those ruinous tiny tunnels. Their vegetables are in constant rotation. 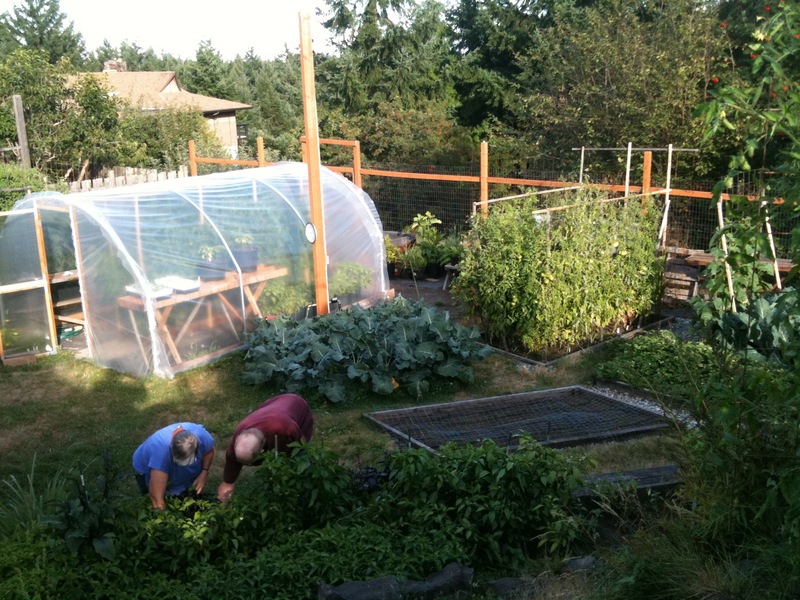 They have harvestable vegetables every day, year round. When they aren’t planting or harvesting, they are preparing vegetables to fill their 4 freezers. When they’re not in the garden they’re thinking about the garden and its possibilities. Both Diane and Paul admit, “We have always looked for opportunities to grow things”. Lucky for all of us.